Making faux tuna using garbanzo beans isn’t an idea original to me; I simply modified the idea to mimic how I used to make the real deal. It’s quick, easy and can be made nearly on the fly. It also happens to be delicious and full of healthy and filling fiber. Plus, the vitamin C-rich red bell pepper helps your body absorb the iron found within the garbanzo beans more readily. It’s an all ’round rock star of a sandwich filler. Using a potato masher, mash the garbanzo beans in a large bowl. You could use a food processor for this, just be careful not to over-process the beans. You do not want a purée, but rather a coarse mash with texture. Add the remaining ingredients to the mashed beans and season with salt and pepper to taste. Sounds yum! Must make this soon! 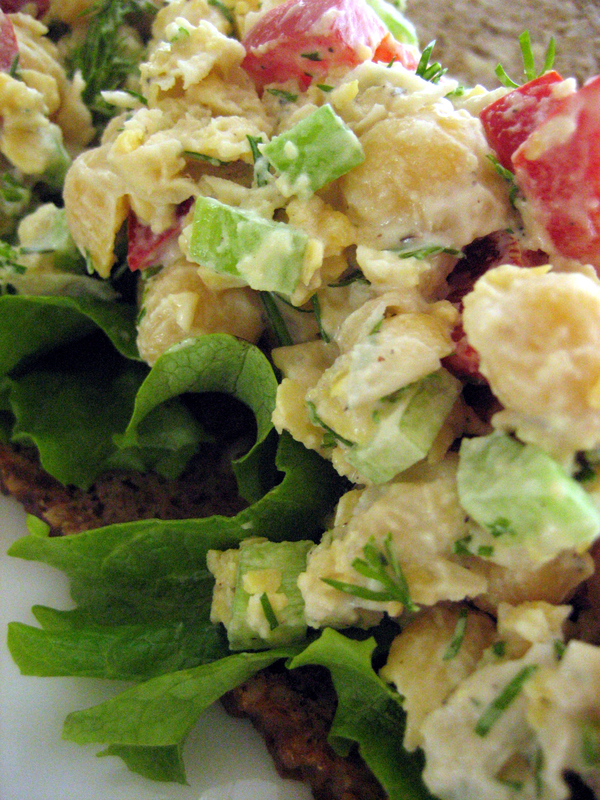 Never ever ever did I think about putting apple in my “tuna” salad- it sounds positively delicious! Thank you for sharing! I love the texture and hint of sweetness that an apple adds to this. I love the flavor contrast with the salty pickle. Enjoy! Looks cool. Maybe you can add some avocado next time? For me, no matter what salad, I always want to put avocados on top. Hope you can find out recipes that excite you! Love this recipe! I will definitely be making this again and again! Thanks! Made this today, only my local grocer does not carry non dairy yogurt or vegan mayo, so I subbed olive oil, mustard, lemon juice, and garlic powder. It was really yummy. I suppose it would be just as good with the mayo. 😉 Thanks for sharing! You’re most welcome Debra. Good choice on the alternatives, BTW.